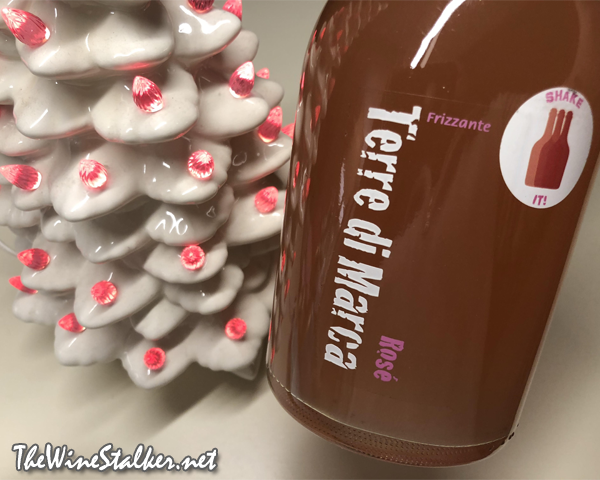 Terre di Marca is a label of Azienda Corvezzo, which is located in the Veneto region of Italy. The Terre di Marca label specializes in Prosecco and Pinot Grigio, but all wines by Corvezzo are 100% organic. They started the organic conversion in 2010 and completed it in 2017. I’m not going to waste time by going further writing a blurb about them because you have GOT to see their awesome website called The Organic Prosecco (http://www.theorganicprosecco.com). It’s got a fun and educational layout to show you how they go about making their wines organically. The “Sur lie” wines are produced the way the Italian ancestors made Prosecco (or sparkling wine, really). They’re both unfiltered and undergoes a natural second fermentation (carbonation) in each individual bottle. Prosecco today is filtered and sees second fermentation in large pressurized stainless steel tanks. The Rosé “Sur lie” Frizzante is made from 100% Raboso on limestone soil, has a 10.5% ABV, and 0 grams of residual sugar. Because this is unfiltered and the lees remain bottled, you will notice a lot of sediment on the bottom when you buy it. So you’ll need to hold the bottle upside down from the neck and shake it by swirling the bottom around to bring that sediment back into the wine. Be careful, though. This is carbonated. If you just shake it up and down like a maniac, like you’re trying to prank somebody with a soda, you’ll have wine exploding all over yourself and your ceiling. The wine is hazy, with an almost peachy/salmon color. Oh man, the nose is just great and keeps you sniffing. Under a cloud of toasty yeastiness there’s aromas of currant, pomegranate, limes, and white pepper. On the palate it’s light bodied with a surprisingly slippery mouthfeel for frizzante, and a perky and lively acidity that demands attention. There’s flavors of pomegranate, tart berries, lime, and white pepper. Then it finishes crisp and tart and refreshing. I freaking love this. I love its personality. It’s so very interesting on the nose and so fun and thirst quenching on the palate. That tart acidity on the finish is just begging for some food, too. Suddenly I really want fish tacos to pair with this. Unfortunately it doesn’t look like this is available in United States right now, but it’s sold for roughly $13 in the European Union. So I’m running with that. And I’m giving a damn good score. Previous Article What’s Happening in San Francisco?